In some situations a barricade is a better solution—for instance, to block off larger areas or when floor care will take a long period of time. 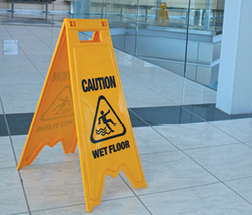 Staying up to date with the latest standards for floor safety is another way you can help prevent slip-and-fall accidents. The NFSI is an ANSI Accredited Standard Developer and the federal government requires that businesses conform to ANSI standards. For more details on the ANSI/NFSI standards, click here.